Soon we’ll have a much better idea of what we are buying, and companies will be shamed into sourcing products better. 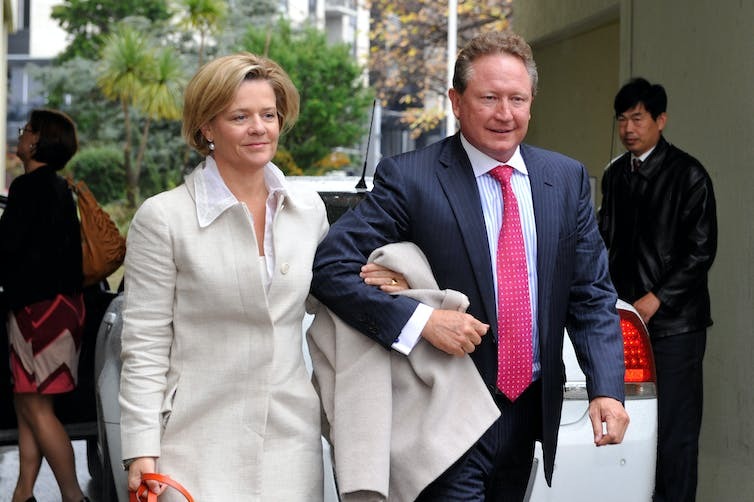 Businessman Andrew Forrest and his wife Nicola are strong advocates of anti-slavery measures. There has been a flurry of activity recently in relation to establishing a Modern Slavery Act in Australia. This has included a parliamentary inquiry and Labor’s recent policy release on the topic. Is slavery a problem in Australia? First, there is no doubt that activities associated with modern slavery, such as human trafficking, servitude and forced labour, are grave human rights issues, requiring a dedicated and co-ordinated response. Governments cannot solve the problem on their own. It is a particular issue in countries like India, but also occurs in Australia. Between 2004 and 2016, the Australian Federal Police received almost 700 referrals relating to suspected human trafficking and slavery-related crimes, though only 17 people have so far been convicted of these offences. Most recently, in February 2017, two men pleaded guilty to charges of servitude relating to their treatment of Taiwanese workers in Brisbane. Recent media reports of exploitation of migrant workers in Western Australian farms and market gardens, Victorian farms, and in 7-Eleven retail stores nationwide, suggests this is a real – but often hidden – issue in Australia. What developments are underway for a Modern Slavery Act in Australia? Moves are underway in Australia to introduce new laws to tackle slavery that will operate outside the existing criminal law framework. On February 15, a parliamentary inquiry into establishing a Modern Slavery Act in Australia was launched. The terms of reference for the inquiry specifically refer to the UK’s Modern Slavery Act and to relevant findings from the Joint Standing Committee on Foreign Affairs, Defence and Trade’s 2013 report Trading Lives: Modern Day Human Trafficking. Although the UK’s Modern Slavery Act has seven parts, including protection for victims, civil and criminal provisions, new maritime enforcement mechanisms, and the establishment of an anti-slavery commissioner, the focus has overwhelmingly been on its impact on businesses. The act and associated regulations require businesses with a turnover of £36 million or more to disclose what they are doing to eliminate slavery and trafficking from their supply chains and their own businesses. It appears there is support from people in the business community, and faith-based and other non-governmental organisations, for a similar business reporting initiative in Australia. A key promoter of the introduction of a Modern Slavery Act here is businessman and philanthropist Andrew Forrest. He and his wife Nicola established Walk Free, a Perth-based international non-governmental organisation with a mission to “end modern slavery in our generation”. Walk Free was one of the 173 organisations and individuals to make a submission to the parliamentary inquiry. Although submissions varied in terms of how modern slavery and trafficking might best be tackled, there was broad, in-principle support for the introduction of an act. This includes submissions by businesses such as Qantas and Wesfarmers, both of which already report on their anti-slavery efforts under the UK legislation. There is apparent bipartisan support for the initiative. The Coalition government has been exploring options for business reporting over the last several years through the Supply Chains Working Group set up as part of the National Roundtable on Human Trafficking and Slavery. Labor has expressed strong support for the introduction of new business reporting obligations, proposing to go further than the UK by imposing penalties on businesses in Australia that fail to report on their anti-slavery efforts. In the UK, as well as at an international level, compliance with such reporting obligations is primarily driven by considerations of public opinion. Several voluntary international obligations relevant to modern slavery exist. Globally, more than 9,400 organisations from over 160 countries have committed as participants to the United Nations Global Compact (UNGC). This is the world’s largest corporate sustainability initiative, actively engaging in responsible human rights and labour practices. The Global Compact Network Australia (GCNA) brings together UNGC participants, other leading companies, non-profit organisations and universities – including the University of Western Australia – to advance these same goals in Australia. Furthermore, the UN has guiding principles on business and human rights. Foreign Minister Julie Bishop has recently established an advisory group on the implementation of these principles. OECD guidelines for multinational enterprises also apply to Australian businesses. For example, the associated dispute resolution mechanism has been used to bring a complaint against security firm GS4 Australia for conditions and alleged abuse of detainees on Manus Island. Will an Australian Modern Slavery Act prove effective? Last week’s visit to Australia by Kevin Hyland, the UK anti-slavery commissioner, was timely. Although the UK legislation has received a cautious welcome so far, it is too early to judge whether it will have any meaningful impact on reducing worker exploitation. In Australia, longstanding criminal laws against trafficking and slavery have not prevented their occurrence and, for the most part, have not been relied on by authorities to prosecute exploitation. The effectiveness of pursuing employers for the exploitation of migrant workers via the Fair Work Ombudsman is also limited. By extending the responsibility to tackle exploitation to include business and not just government, it is hoped that the introduction of an Australian Modern Slavery Act will help tackle worker exploitation. However, there remains a risk that this initiative will continue the trend of side-stepping the root causes of worker exploitation in this country. Vulnerability to workplace exploitation is closely connected to the regulation of migration and labour. Therefore, as well as receiving the support of Australia’s business community, any proposed solution to this problem must engage with government policies and practices affecting migration and migrant labour to reduce worker vulnerability.